For fifteen years, traces of methane have been detected in the atmosphere of Mars. The European Mars Express spacecraft and the American Curiosity rover have highlighted seasonal peaks of this gas. These observations generate a lot of interest. Methane is indeed a gas that is associated with the process of living on planet Earth. However, Martian methane is very difficult to detect. Observations from the Curiosity rover and Mars Express are based on one-off events and minute amounts. The ExoMars Trace Gas Orbiter (TGO) probe has so far not detected methane, although it is particularly well equipped for this task. However, a team working on the Mars Express data has just provided definitive proof that this gas exists in the Martian atmosphere. The data we are interested in are quite old because they date from June 16, 2013. After a lot of work to reinterpret the data of the space probe, the researchers were able to highlight a methane emission peak in the region of the crater Gale during this day. But just 24 hours before, Curiosity was doing the same observation in the same area. The probability of two instruments on the ground and in orbit making the same mistake at the same time seems extremely low. But this does not give any indication of the possible origins of the methane generated by the planet Mars. 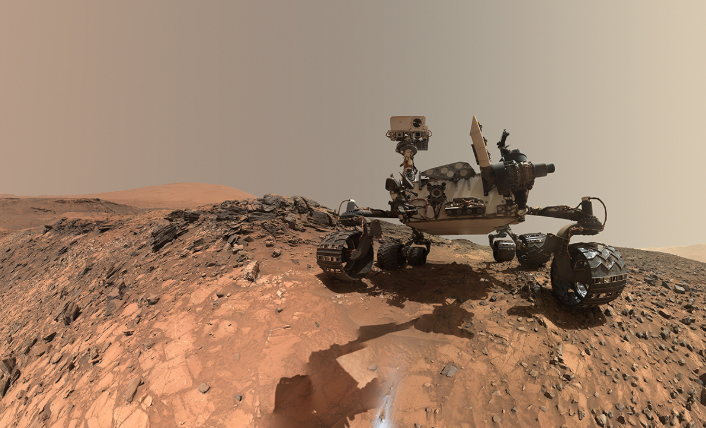 The team working on the Curiosity rover is convinced that methane comes from the ground. The source would be in the depths of the planet Mars. But for the moment it is impossible to know if the origin of methane is geological or biological. Both explanations remain plausible. However, we can hypothesize the geographical source of the methane emission. The Aeolis Mensae region is for the moment the main region suspected of emitting methane. Located northeast of Gale Crater, it consists of complex reliefs due to tectonics and Martian winds. In particular, it would have cliffs that could dive to layers of ice. Methane may have been trapped in this ice and released periodically. We imagine that the data of ExoMars Trace Gas Orbiter will be studied with great care. The Curiosity rover could also record new methane peaks. At the end of the 1970s, the Viking program’s orbiters spotted for the first time dark tracks evoking flows on the surface of Mars. Since then, these flows have been observed many times by different missions. Some photos show a 600-meter long flow. Despite multiple observations, the specialists of the planet Mars are still divided on the explanation of the phenomenon. Obviously, the debate is whether they are dry flows or wet flows. The first hypothesis would be the consequence of a kind of avalanche of dust without water or any other liquid. The other hypothesis implies that the flows consist of kind of brine, an aqueous solution that is highly saturated with salt. Since the arrival of new orbiters around the red planet, we accumulate more and more precise images of the phenomenon, which makes possible to put forward new characteristics of these flows. We know that they form on reliefs and then flow on more or less steep slopes. They tend to widen as they go down. In some cases, they are even able to go up a few meters to overcome a terrain obstacle. The phenomenon does not appear particularly related to the seasons. It seems more important in the equatorial region. The majority of events are punctual. We observe a flow once at a place without the phenomenon being repeated in the next decades. These parameters are difficult to reconcile with assumptions about the dry or wet origin of these flows. The absence of seasonality and the fact that the flows can climb a slope over a few meters is not completely compatible with a liquid origin, but as no accumulation of debris is observed against the obstacles of the ground, the hypothesis of an avalanche of dust is also difficult to envisage. To try to solve this dilemma, a Swedish university team focused on the Salar Uyuni region in southwestern Bolivia. It is the largest salt desert in the world. The conditions in this desert are in some aspects quite close to what is happening on the planet Mars and we can observe dark flows there. By comparing photos of these flows taken from Earth orbit and Martian, the similarities are numerous. This is obviously not enough to conclude that the wet hypothesis is the right one. The researchers note, however, that it would be interesting to further explore the analogy between these two regions. The easiest way would be to go directly to the Martian surface, but it would expose to a high risk of contamination. If the wet hypothesis is indeed at the origin of these Martian flows, then a biological activity could take place there. The Curiosity rover also had the opportunity to approach one of these flows in September 2016. NASA preferred to make a wide detour for fear of contaminating these flows. In 2021, the arrival on planet Mars of NASA’s next mission, named “Mars 2020”, could get things done. It will be composed of a rover and a small helicopter, which will perhaps allow NASA to observe one of these flows a little closer without risking upset a possible local ecosystem. In recent years, the discovery of methane on the planet Mars questions the scientific community. This gas could signal the presence of a biological activity or be the consequence of a chemistry unrelated to life. On planet Earth, we generally associate the presence of methane with the activities of the living. The Curiosity rover has highlighted traces and seasonal peaks of this gas on the red planet. The european orbiter Trace Gas Orbiter (TGO) was to confirm this discovery. TGO has just published the results of its first research. The European orbiter has not found any trace of methane. TGO has been designed for this type of detection. The main mission of the European orbiter is to detect the various gases present in the trace state in the Martian atmosphere. Two of its instruments designed in Belgium and Russia are specifically designed to find methane at extremely low concentrations. The absence of detection by these two instruments is therefore a real surprise. 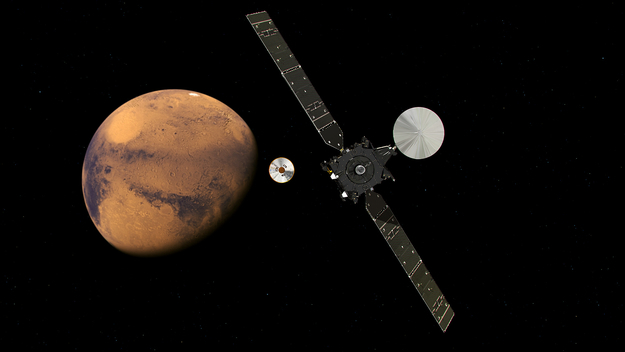 Mars Express, another European orbiter, had for the first time highlighted the presence of methane in the Martian atmosphere in 2004. The Curiosity rover had subsequently made similar detections from the Martian soil. But in both cases, the quantities of methane detected were very small. So now we have to find an explanation for Curiosity rover detections and for the TGO detections. Either one of the two sets of instruments did not work properly, either the data were not interpreted correctly, or we face a seasonal or atmospheric phenomenon that facilitates detection from the ground but not from space. The team in charge of the Curiosity rover seems rather optimistic. It took them several years to discover the methane cycle in the rover data, so they think that their European colleagues need a little more time to observe and reach the same conclusions. According to them, methane forms below the surface of the planet Mars and then escapes into the atmosphere along microcracks. It would therefore be more easily detectable from the ground than from the Mars orbit. In a way, the results of TGO could help validate this hypothesis. The European orbiter has very clearly demonstrated that Martian methane is not formed at altitude. If it is present, it may be detectable only near the surface. It is also possible that the Curiosity rover was very lucky. The NASA rover may have been in one of the only regions where methane is formed. If the rest of the planet does not emit as much methane as the Gale crater, then it is not surprising that it is very difficult to detect methane from the Mars orbit. The European orbiter will continue its mission at least until 2022. There are many indications that Mars has had liquid water on its surface in the past. But about 3.7 billion years ago, the erosion of the atmosphere would have dried up the oceans of the young red planet. There is still water on Mars, but in the form of ice concentrated in the polar caps of the red planet, and it has taken refuge under the surface. A study that has just been published by the NASA research center estimates that the Martian surface is a thousand times drier than the driest of terrestrial environments, the Atacama Desert in Chile. If Mars is completely arid on the surface, it may be different in depth. In 1987, a researcher at the Planetary Science Institute speculated that pockets of liquid water may have remained at the base of the Martian polar ice caps. At the time, lakes had been highlighted deep underground under Antarctica and Greenland. The researcher felt that a similar scenario was quite plausible on Mars. Since then, the hypothesis is debated without it being possible to settle definitively. But an Italian team has just published the results of a study based on radar data from the Mars Express probe. A radar is a very effective instrument for searching under the surface. Radar echoes are indeed affected by the materials they pass through. By studying the signals returned, we can get a fairly accurate idea of ​​the composition of soils in depth. The team of researchers looked at what is happening under the Martian polar regions, and among the data collected since 2003 by the European space probe, it found a particularly surprising radar echo. On the planet Earth, it has been noted that the interface zones between ice and liquid water produce very bright radar reflections, and this is exactly what has been observed in the region of the south pole of Mars. A small area 20 kilometers wide produces radar echoes consistent with what would be expected from an icy or liquid surface. This Martian lake would be buried one and a half kilometers below the surface of the planet. Italian researchers were able to determine its depth and at least 1 meter. For liquid water to exist under these conditions, it must be particularly salty and sedimentous. It is rather a lake of brine and mud that you have to imagine. The discovery is not final either because the team at the origin of the study has studied several scenarios to explain the radar returns collected. The lake hypothesis is the most plausible but it remains a hypothesis. The observation of Mars Express does not close the debate opened 30 years ago. If the discovery is confirmed, then there will be a lot of questions to answer about this lake. Is it alone? What is its composition and temperature? Liquids are not automatically sources of life. But if life could ever hatch and survive on Mars, this area remains one of the best places to look. There is no doubt that future Martian missions will be influenced by this discovery. Obviously, we are thinking of drilling to the lake, but for the next few decades there is little chance that this will happen. An orbiter equipped with a better radar than the one from Mars Express could however provide more details about the environment of the lake, and may even discover new ones. Mars has hosted large amounts of liquid water in the distant past. It was the loss of its atmosphere that began 4.2 billion years ago that gave it its desert appearance. But that does not mean that the water has completely disappeared from Mars. We know that a large part of this water has taken refuge in the basements of the planet in the form of ice, particularly near the polar regions. But according to a study published in Science magazine on Jan. 12, water ice would also be present in large quantity in the more equatorial regions of the red planet. The team behind the publication used Mars Reconnaissance Orbiter mission data, which orbits the planet Mars since 2006. Using the orbiter’s HiRISE camera, they identified eight regions that would house underground glaciers up to 100 meters thick in some places. These glaciers are exposed to the open air by particularly steep cliffs, and even when covered, it would be sufficient to drill to reach them. Such sites have been discovered both in the northern hemisphere and in the southern hemisphere of the planet. Obviously, this makes them interesting targets for exploring the red planet. These layers of ice are indeed easily accessible. Drilling could help dive into Mars’ climate past and learn much more about its recent evolution. We know for example that Mars is much less stable on its axis of rotation than the Earth, because of the absence of a massive natural satellite. The rhythm of its seasons has changed a lot over time, and it should be visible in the ice. This is also great news for anyone who wants people to move to Mars. According to some estimates, up to a third of the surface of the planet Mars would harbor ice in the basement. Water would be a commonplace resource on Mars. For SpaceX for example, which relies on the electrolysis of Martian water to produce oxygen, it would be enough to dig. Most of the basic Martian installation projects were previously on the poles, where it was thought that the majority of Martian water was retained, or on the equatorial regions considered more hospitable. Now the equator seems better to accommodate a human presence. In addition to abundant water, it offers the best sunshine, the best temperatures and it is the best location to reach the orbit. Let’s hope that a robotic mission will allow us to learn more about these underground glaciers, and of course about our neighbor’s recent past. Mars has a rich history of water and atmosphere. Indeed, Mars most likely had an abundant water cycle between 4.2 and 3.7 billion years ago. But has that been enough to allow time for life to appear ? Answering this question is a priority for all space agencies interested in Mars. A team from the Los Alamos National Laboratory in the United States of America has just published a study providing a new clue in this survey. 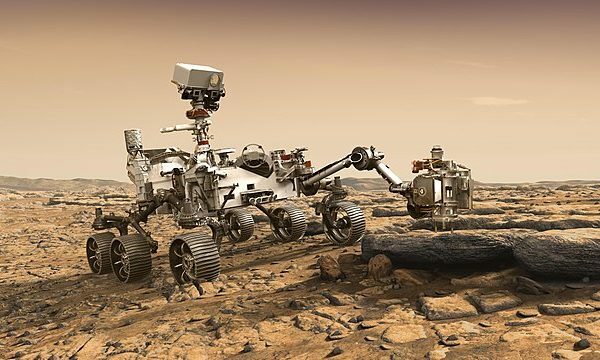 Indeed, by analyzing the data of the Curiosity rover, they were able to detect residual traces of boron. Boron is a chemical element considered quite rare in the solar system. But its presence would be necessary to the appearance of one of the fundamental elements of life as we know it on Earth. Indeed, to form this element would need a sugar called ribose, which is unstable and decomposes rapidly in water, unless it is stabilized by the presence of boron. The discovery of boron on the surface of Mars does not guarantee that this chemical element could have formed in the primordial oceans of the red planet, but it is a sign that an additional condition was present for this to happen. The observations that led to this discovery were made in the Gale crater, which is the area of ​​operations of the Curiosity rover. This crater is 3.8 billion years old and probably hosted a water lake in the beginning. It was possible to analyze the chemical composition of the soil using the instruments of the Curiosity rover. It uses a laser beam to vaporize a small amount of materials that can be analyzed using spectrometers. It is one of the twelve scientific instruments that equip the rover. The Curiosity rover has been rolling in the Gale crater since August 6, 2012. It is a much bigger rover than its big brothers Spirit and Opportunity. The primary mission of Curiosity is precisely to specify if conditions conducive to life have ever existed on Mars. In four years of studying the Gale crater, the rover has been able to bring many clues to the red planet’s rich water past, but also to the atmospheric loss that has affected Mars. The Gale crater, with its rich history of water and life-giving elements, offers a perfect target for the search for a fossil or present microbial life. NASA hopes that the Curiosity rover will be able to continue its mission for a few months or years. It has indeed already suffered on its wheels. It uses a non-renewable energy source, unlike Opportunity. We hope that until then there will be enough time to provide additional information on the conditions that prevailed in Mars at the time the Gale crater was Gale lake. A Franco-American team has just published a surprising study about the planet Mars. They think that there is snow on Mars, snow like the one we know on Earth. This phenomenon would occur during the Martian night, when the temperature drops on the red planet. This forces scientists to rethink their understanding of the Martian climate. Mars has a much finer atmosphere than Earth. The formation of water clouds is therefore very rare. It takes a dense atmosphere to support the phenomenon of condensation that we find in our clouds. We already knew that there is dry ice on Mars. If the presence of snow is confirmed, scientists will have to revisit their understanding of the water cycle on the red planet. To reach these conclusions, the team of Aymeric Spiga from Pierre and Marie Curie University (UPMC) used the data provided by the various satellites and landers which visited Mars. They developed a weather model that allowed them to extract this prediction. However, it will be necessary to confirm this by observations, why not by a CubeSat. This Martian snow is different from the snow we know on Earth as the precipitation would be very fast, the snow would fall on the ground in a few minutes instead of flying in the wind like on Earth. Once in contact with the surface of Mars, it would not form a soft and mellow coat but rather a layer of rigid ice. This confirms that although water is not present in liquid form on the surface of Mars, it is relatively abundant in the form of ice. This is good news for future human exploration programs. But it is also important to understand all the meteorological phenomena that explorers may encounter. Indeed, a Martian snowstorm could damage their equipment.